Joints aspiration and injections are common practice in the elderly medicine and can be used to diagnose and treat some of the musculoskeletal conditions. Joint injection is a relatively safe procedure if associated with good knowledge of anatomy and awareness of the potential complications and contraindications. Different approaches can be used for arthrocentesis, but the discussed techniques in this chapter are the ones used most commonly by the authors. Appropriate training involves knowledge of anatomy and practical skills are key requirements. CKS. Rheumatoid arthritis. 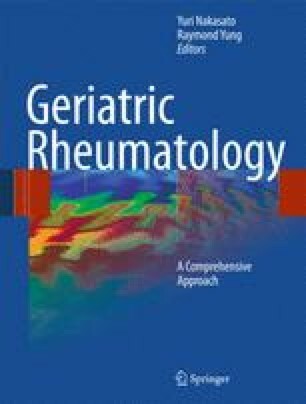 2005. http://cks.library.nhs.uk/rheumatoid_arthritis/management/quick_answers/scenario. Accessed 20 July 2008.